Limoso offers the best transportation in Gold Coast, Byron Bay, Tweed Heads, and Coolangatta. Coolangatta and Tweed Heads are the southernmost suburbs of Gold Coast and have a shared economy. We offer family friendly airport transportation from Brisbane Airport to Coolangatta and more. Coolangatta is also home to Gold Coast Airport (OOL), formerly known as Coolangatta Airport. We offer OOL airport transfers throughout the region. Start your trip with a Limoso chauffeured car hire. 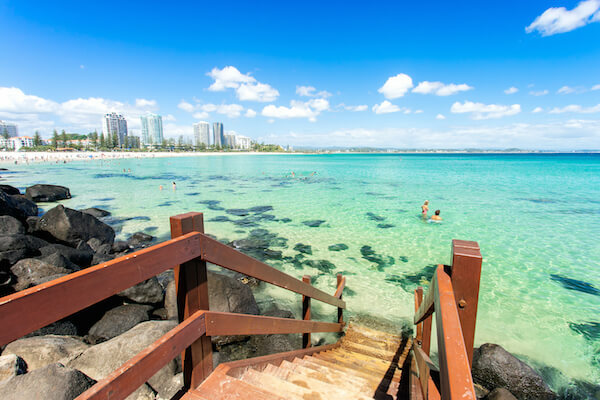 Coolangatta and its "Twin Town" of Tweed Heads are known for tourist destinations like Snapper Rocks, Mount Warning, Border Ranges, Springbrook and Lamington National Parks. The Tweed River also supports a great fishing fleet making the area well-known for its seafood as well. Take your Coolangatta holiday with a Limoso car hire. Resorts and clubs in the area include Mantra Twin Towns, Twin Towns Services Club, Tweed Heads Bowls Club, and Coolangatta Tweed Heads Golf Club. Our amusement park car services are great way to past the time in Coolangatta. Tweed Heads is also known for retirement villages and facilities. For holiday or retirement transportation in the Tweed Coast, let Limoso lead the way. Besides Brisbane and Gold Coast airport transfers, Limoso has limousines and car hires for any occasion in Coolangatta. Our fleet of luxurious sedans, limousines, motor coaches and people movers, can be used for weddings, sightseeing, executive transportation, school formals, golfing, and more. Besides Coolangatta and Tweed Heads, Limoso Limousine Services also provides airport transfers and car hires to Kingscliff, Bilinga, Banora Point, and more. Book your next Coolangatta car service with Limoso! From wedding car hires, Sea World Gold Coast car services, executive sedans, or airport services, Limoso is the best chauffeured limousine hire in the Coolangatta, Tweed Heads, and more.